Here is my pattern for the Kindle paperwhite, Kindle Fire and Kindle Fire HD. The cozy measures 7.5" x 5.5"which holds the 7.6" x 5.4" size kindle very nicely and securely. The pattern is my own and is so easy you can make two of these while watching your favorite television program. I know you will love crocheting these for all your family members who own that cool Kindle, have fun! 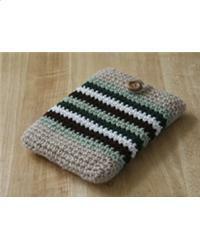 Size will vary slightly depending on the yarn used and your style of crochet. Project Size: 7.5" x 5.5"